The stone circle at Machuim is in quite a ruinous state, but nonetheless has an impressive feel to it. 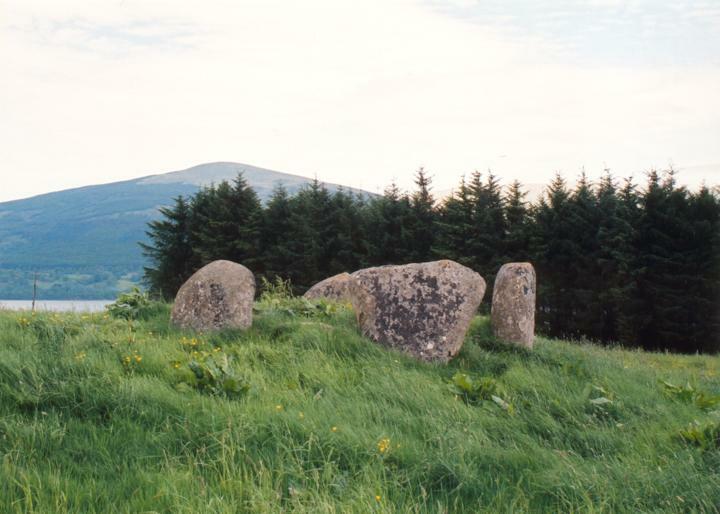 With a look more akin to the circles of Aberdeenshire than Perthshire, it is made up of several large stones crowning a round mound protruding from a long natural ridge across the field. It has previously been listed wrongly by writers as Machulm or Machuinn. Only four stones remain standing, while there are a further three that look as though they once stood. The earth mound on which they stand is approximately 10.0m in diameter, and on its SE side reaches a height of 1.0m above the field surface. Some field clearance material has been placed within the circle, but there is also a circle of kerb stones around the base of the mound. Although the condition of the circle is quite sad, it enjoys a position on the lower slopes of Ben Lawers, which rises impressively behind it, affording good views across Loch Tay to the hills on the other side. Machuim is in the parish of Kenmore and the county of Perthshire. Published on the 14th of May 2010 at 4:20 pm. Updated on the 11th of May 2015 at 1:05 pm.